Texas Housewife: "My Heart Is Filled With Such Sorrow"
"My Heart Is Filled With Such Sorrow"
Ashley was taking a bath and playing with her HSM Troy and Gabriella dolls. I have fond memories of playing with my Barbies in the tub and she loves it just as I did. Anyway, she decided to wash their hair. When she started massaging the Pantene into Troy's lovely locks his head popped off. Ashley freaked out. I tried to calm her and did everything I could to pop his head back on. No luck. So, I get Ashley out of the tub and into pajamas, reassuring her that certainly Daddy can get Troy's head back on. 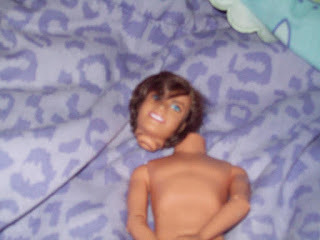 Daddy could not get Troy's head back on. We both tried everything we could think of. Poor Ashley said "Troy is dead. It wasn't his time. My heart is filled with such sorrow." I was a good mom and did not crack up laughing over this pitiful display. Then she asks "Do we have to bury Troy?" That is the point at which I burst out laughing. She knows it's just a toy, but if you could've seen the look on her face...well you would've cracked up too. Tristen is building him a coffin. Ashley has written him a tombstone on a piece of paper. He came to live with her on Christmas Day, so he sure didn't last very long. Tomorrow is poor Troy's funeral. I think it's sort of odd to bury a plaything, but Ashley loves him and insists he cannot be just tossed in the garbage. Parenting is such an interesting adventure! Goodbye, Troy. Ashley will miss you. Poor Troy. Are you sure he can't be fixed? Seems we could do this some how. But maybe this is the way of the world. You treat a guy nice, bath him and wash his hair...then next thing you know he has lost his head. Just sorta happens like that. Too bad Troy could not stick around longer. Maybe Ken could come and do a fill in spot. Your kiddos are so friggin cute. This is one of those things you can never let yourself forget, you know, so you can retell it to all of her friends and boyfriends as she gets older, lol.